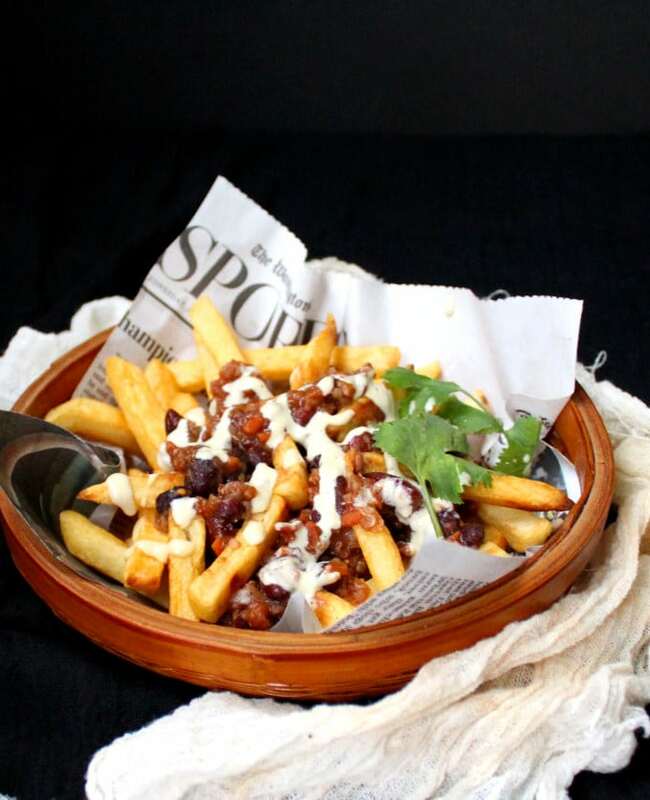 Serve these Vegan Chili Fries with Cheezy Horseradish Sauce at your Super Bowl gathering and you’ll have more people cheering for you than for the Patriots or the Eagles. 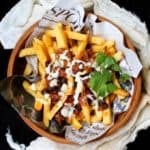 Crispy, crunchy, golden potato fries are smothered in a smoky, delicious bean and quinoa chili and all of it is drizzled over with a cheezy horseradish sauce that’s to die for. 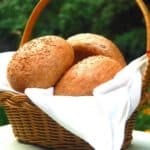 A vegan, gluten-free, soy-free recipe. There’s really nothing quite as rewarding as taking a fun recipe and turning it into something that’s still fun but also good for you. 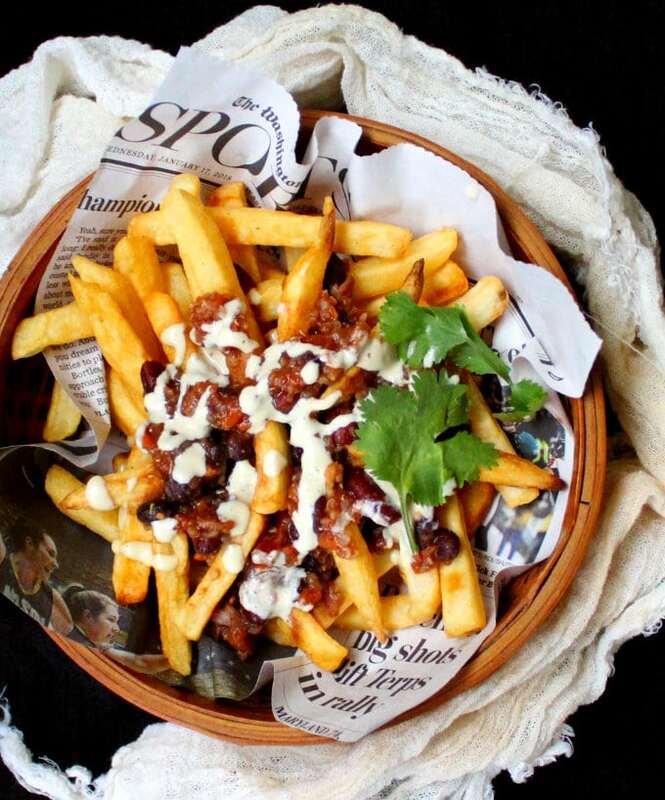 Like these Vegan Chili Fries drizzled over with the creamiest, dreamiest Cheezy Horseradish Sauce. Since I have a kid at home, potatoes — and more specifically French fries — are pretty much a food group by themselves. But I don’t mind, because what I usually make for Jay are these healthy and guilt-free French Fries, which I posted many years ago. The fries are baked naked with just some cooking spray, and they come out all golden and crispy and crunchy and wonderful. You can save yourself the trouble and buy store-bought frozen fries and bake them. 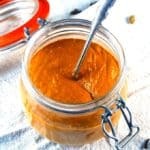 With the deliciously healthy chili and nutty sauce, you’d still be serving up a very healthy snack. 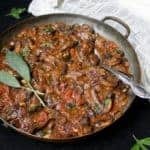 The chili recipe I have for you today is one of my favorites. It has two kinds of beans — kidney and black — carrots, tomatoes, and a helping of quinoa to add nuttiness and flavor, not to mention more nutrition, of course. And the cheezy horseradish sauce, oh that sauce! 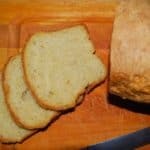 It’s creamy and cheesy but it’s also got that unexpected bite of the horseradish that takes it over the top. You might want to leave the horseradish out if you have kids around (I don’t add it for Jay who finds it difficult to handle), and the sauce would still be tremendously tasty. 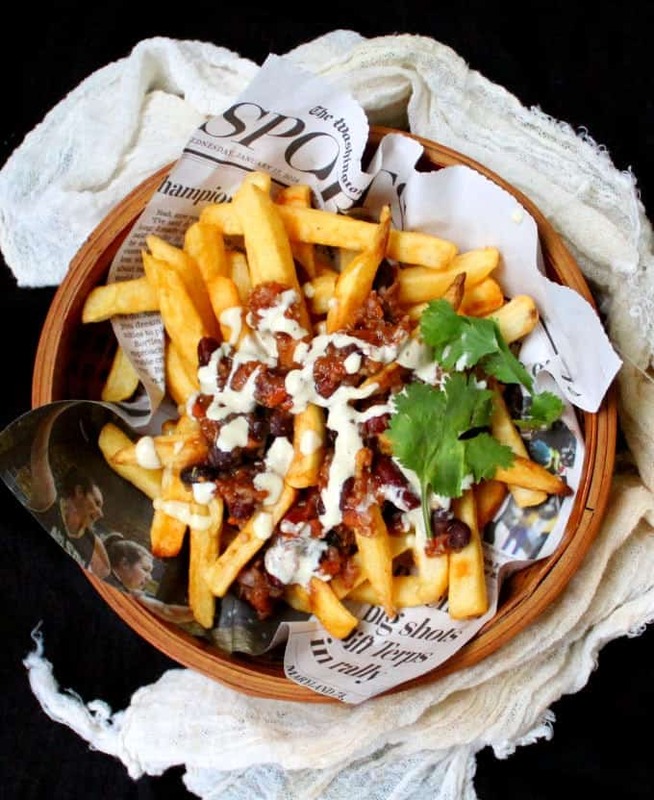 I won’t leave you waiting any more– I know I can’t wait to dig into this bowl of vegan chili fries. If you try them, be sure to let me know! Heat the oil and add the onions and garlic. Add a generous pinch of salt and saute the onions until they start to caramelize, over medium heat. Add the cumin, paprika or chipotle chili, oregano, onion powder and garlic powder and stir to mix. Add the tomatoes and carrots and let the tomatoes cook down until soft, stirring occasionally. Add the beans and the quinoa to the pot along with 1 1/2 cups of water. Bring to a boil, reduce heat to a simmer, cover the chili, and let it cook 45 minutes or until thick. Add water as necessary if it starts to get very thick during cooking. Add salt to taste and turn off heat. Place all ingredients in the blender and blend until very smooth. 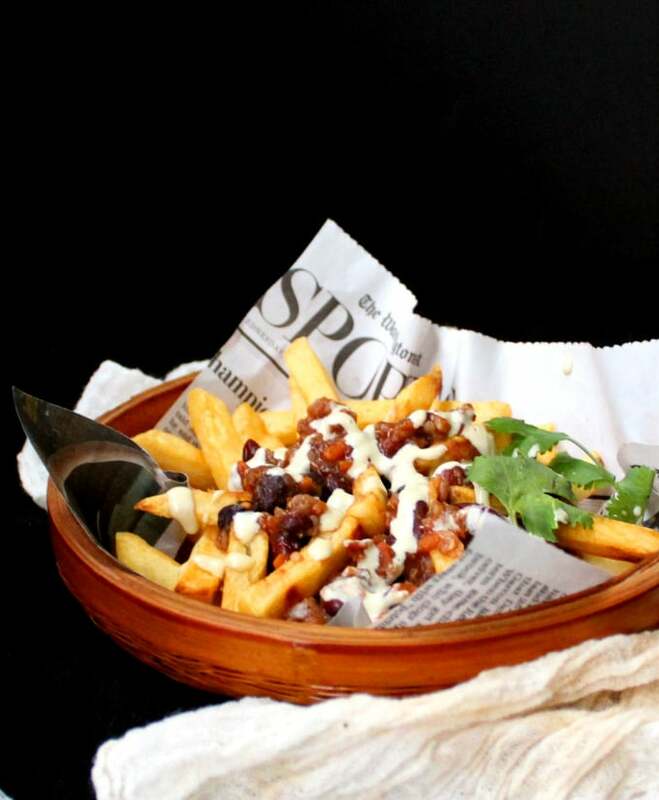 Place the baked fries in a bowl or a dish, drizzle over with the chili, and then the cheezy horseradish sauce. Garnish, if you wish, with some cilantro leaves. Serve. Click here for Guilt-Free French Fries recipe. 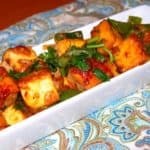 For an even healthier version, make this with Plantain Fries or Sweet Potato Fries. 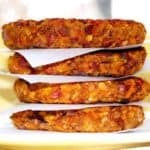 « 66 Kid Friendly Vegan Recipes. 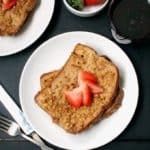 A vegan mom’s guide to stress-free, fun and healthy meals for the family. This seriously may be in my future—probably next Sunday (I won’t even be watching the SuperBowl, but this may be as close as I get to eating like other people do for the SB, albeit vegan/homemade/healthier. Your photograph is gorgeous. Love the Washington Post sports section as a backdrop. I’ve not bought horseradish for years, but this has enticed me. So you think regular fries instead of sweet potatoes for this? Hi Ellen, Sweet potato fries would be amazing with these– that or plantain fries (it’s in the notes). Since you’re also a Costco member, I love the sweet potato fries they sell in a huge bag (I think it’s Alexia, but I could be wrong about the brand). 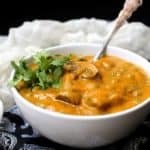 Hi Vaishali, Your recipes are always delicious.Even pics look so good.I feel energized to cook the recipe.Thanks for these.I will definitely try. 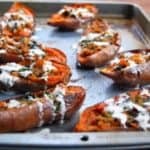 I tried these last night for a fun dinner for the kids, and everybody LOVED it. The chili is so delicious, my five-year-old licked his bowl up. Tracie, so happy to hear! Thanks for letting me know. Absolutely terrific—all 3—crispy potatoes, horseradish sauce, and chili. I don’t watch the Super Bowl, but this gave me something fun to have tonight—a little different than what I normally have. It’s kind of like an Americanized poutine. Will come up with other ways to use the horseradish and horseradish sauce—this is the first bottle we have ever bought! I didn’t think I liked horseradish all that much (don’t love the wasabi with sushi), but I loved this sauce. I’m thinking like a Buddha/hippie bowl type thing, with roasted beets and brussel sprouts, that sort of thing. What made you think of horseradish for this? The Canadian poutines I make use a “cheese” sauce and a mushroom gravy—would never have thought of horseradish. What else do you sue it for? Hi Ellen, so happy you made it! I haven’t used horseradish much in my cooking in the past, and I’ve been ambivalent about it too, but I bought some horseradish after recently eating some amazing appetizers at an Ethiopian restaurant– they had little cucumber cups filled with a creamy horseradish sauce. I thought how great the horseradish would be with the crispy fries and earthy chili. 🙂 I love the idea of a Buddha bowl with a horseradish sauce drizzled over it. 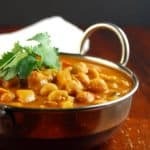 Hi Vaishali! I made this last night and it was a huge hit! My friends even asked for the recipe because they can’t get enough of it. As for me, I really like how all the ingredients and flavors blend so well. This would be perfect for movie nights and weekend get-togethers.